The Odyssey Restaurant, strategically located between the World of Motion/Test Track and Mexico Pavilions, was one of my favorite restaurants when I was a child. Mostly because I would remove my grilled chicken sandwich from its basket, place it on a napkin, and then proceed to make a gargantuan salad from the items available at the toppings bar. The Odyssey Restaurant, which also featured live entertainment, opened in 1982 but shuttered itself to regular guest contact by the late 1990s. Since that time, it has been used as a festival center, as a rentable space, and for special events. While most of the facility is closed, the restrooms, first aid, and baby care areas are still as functional today as they were in 1982. The odd piece about the Odyssey’s restrooms is that while most guest will use these bathrooms near the First Aid center, they are unaware that on the far side of the building, located inside of the Odyssey restaurant, are a second set of bathrooms that are still accessible. Almost always deserted, stepping into these quiet restrooms is like stepping back into EPCOT Center, circa 1982. The hexagonal tiles on both the walls and floors are still present and the color scheme of brown on beige on cream is pure EPCOT Center. While most of EPCOT Center has faded away these bathrooms on the border between Future World and World Showcase, as well as these facilities now found in Norway, serve as a reminder of the days when going to the restroom was a step into the stalls of the future. These days, the Odyssey Restaurant may just sit prettily above the waterways of Epcot, but it is still a sight for sore eyes, and a reminder of the good old days. This is one of the most amazing bathrooms in all of Walt Disney World! 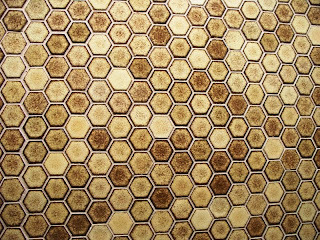 When I first saw them in 2007, I was amazed at the tiles and choice of colors...and the fact they they have never been remodeled. "a step into the stalls of the future"... I love that. And I love the secret Odyssey bathrooms. I hope they're not overrun with groupies now that the secret is out. Those wonderful, never-remodeled corners of EPCOT get fewer and fewer each year. In other news, the back side of the Odyssey building is the main Cast Member cafeteria for EPCOT. Good times. 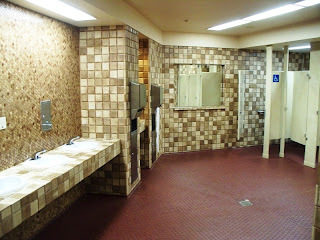 George, it is an especially intriguing choice to me when you consider that a majority of the other restrooms in Epcot and the Magic Kingdom from the time used a similar palate of browns, but stuck to the simple square pattern. Michael, I think we're still safe on the overrun part... I don't have THAT much sway. As for the Discovery Diner, I would love to get some photographs of that cafeteria! As for the never-remodeled corners of Epcot, and Walt Disney World as a whole, thank goodness there are as many crazy souls, like all of us, out there documenting what we can while we can! Okay that is on the must visit list for my next trip. You know if you wait long enough that kind of stuff is back in style. We are getting close. Excellent observation. Thanks. My favorite spot to take conference calls ;-) Great photo history, Ryan. I love the whole late seventies/early eighties thing that's going on with this bathroom. I wish they'd open the restaurant back up to the general public! I hope this never gets touched. I'm actually saddened by the future demise of the Cantina de San Angel, and the tile behind the counter there is also original (and looks all of 1982).